However, the talent factory of the US is now facing competition: Germany. More and more young people from around the globe are making the decision to study, work and live in Germany. Why? What is so attractive about a country whose language is not easy to learn, and that is considered bureaucratic, complicated and overregulated? At this year's meeting of the American Association for the Advancement of Science (AAAS) in Chicago, three young researchers from three different continents will speak at a press event organised by the Helmholtz Association about why they have chosen Germany as their place of work and residence. Xiaoxiang Zhu from China, Daniela Panáková from Slovakia, and Emad Aziz from Egypt met with us beforehand for an interview. The Helmholtz Association is one of the main partners of the AAAS Annual Meeting, which provides a forum for scientists, journalists and communications sector representatives from across the world to come together and share their experiences. The comprehensive programme includes talks, workshops and discussion rounds, and provides an excellent environment for networking. At this year's meeting, which takes place from 13 to 17 February in Chicago, representatives from the Helmholtz Association will hold a panel discussion with three scientists from China, Slovakia and Egypt in front of an audience of over 100 international journalists on the topic of why more and more young people are choosing to launch their scientific careers in Germany. The American Association for the Advancement of Science (AAAS) is an international non-profit organisation for the worldwide promotion of science. Alongside its involvement in the fields of education and social development, the AAAS is also an interest group and professional organisation. The AAAS organises events for its members and publishes the journal Science as well as numerous scientific newsletters, books and reports. 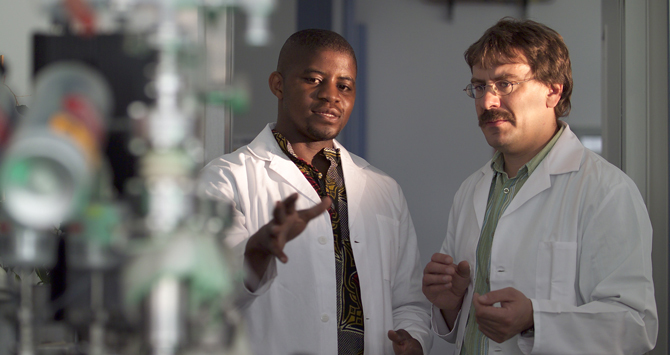 It also implements programmes worldwide to promote a better understanding of science. Xiaoxiang Zhu, born in 1984, works for the German Aerospace Center. You are originally from China but have chosen to pursue a scientific career in Germany. Why Germany? I moved to Germany, and ended up staying here, thanks to a series of fortunate coincidences. After completing my Bachelor's degree in China, I moved to Munich to be with my boyfriend, completed an international Master's programme at the Technische Universität München (TU München), and wrote my final thesis at the German Aerospace Center (DLR). The TU München offered me a scholarship very early on to pursue a doctorate in collaboration with the DLR. Since then, I have been working, researching and living in Munich. What makes Germany so appealing to you as a scientist? Mostly the collaboration between Helmholtz Centres and universities - in my case between the DLR and the TU München. As a scientist in the field of Earth observation, not only do I have access to outstanding information technology facilities, but also to current data from state-of-the-art satellites. I am involved in large satellite projects, and I can teach students, inspire them, and get them excited about my fields of research. You are only 29 years old and you already have a very impressive CV behind you. You are an aerospace engineer and a university lecturer, and you run a Young Investigators Group as well as various projects in the field of Earth observation. What do you still aim to achieve? My current projects are keeping me very busy for the moment. Developing the Young Investigators Group is my top priority; I am responsible for ten students, PhD students and scientists. Our aim is to develop new algorithms to be able to collect more data from future German and European Earth observation satellites. My next personal aim is to gain a professorship, but most of all I want to turn my students and PhD students into successful scientists. I develop algorithms for Earth observation signal processing. Germany is conducting two radar missions (TerraSAR-X and TanDEM-X) and will launch what is known as a hyperspectral satellite (EnMAP) in 2017. The first ESA Sentinel-1 satellite will be launched on 28 March 2014, and we will use its data to develop the algorithms. Based on these radar data, we are aiming to create, for example, three-dimensional city models and to collect information on the deformation of buildings and soil subsidence. Using hyperspectral imaging - images created from many, closely spaced wavelengths - we want to gather information on materials, but also to sharpen the images beyond their initial resolution in order to develop new applications. You work in a field that is presumably dominated by men. Where does your interest in the field come from? I've always been fascinated by space - even as a child. I was also interested in mathematically challenging tasks from a very young age. I took part in numerous maths competitions and I always liked to tackle difficult problems. But I also want to achieve something through my research, ideally as part of an interdisciplinary team. Therefore, what I do for a living today is no coincidence. The satellite technology in the field of Earth observation perfectly combines my passion for space with my maths skills and interests. In addition, the working conditions at the DLR and the TU München are great. And as for women - more and more female scientists are entering highly technical professions like mine. That's mostly down to the internationalisation of our teaching and large-scale research projects. But there ought to be even more female researchers, so my generation is also acting as a role model. Do you plan to stay in Germany? I will be staying in Germany for the time being. Bavaria in particular is close to my heart. However, I am always open to new things and I don't want to rule out the option of spending a few years in another country - the United States, for example. Many aspects of life just fall into place and work themselves out. Xiaoxiang Zhu was born in China in 1984. After completing her Bachelor's degree in Space Engineering in China, she enrolled at the TU München, where she completed a Master's degree in Earth Oriented Space Science and Technology, which links the technical aspects of observation systems with the applications of Earth sciences, satellite remote sensing, and navigation. In 2011, Zhu received her Doctorate of Engineering and began lecturing at the TU München. She runs several project groups. Since September 2013, she has been running a Helmholtz Young Investigators Group researching the field of Earth observation. She lectures at the TU München and is often invited to give seminars at universities in China and the US. She has received numerous awards for her research. Daniela Panáková (born 1976) is a researcher at the Max Delbrück Center for Molecular Medicine (MDC) in Berlin-Buch. You began your scientific career over ten years ago in Dresden, and went on to spend several years in the US, at Brigham and Women's Hospital at the Harvard Medical School in Boston. You then returned to Germany. What brought you back? I'm a European through and through, and I was therefore very keen to base my research in a European country and to foster groups of junior researchers here. In my opinion, Germany is one of the countries that has been most successful in promoting young talent. Alongside the many different targeted funding programmes, there are a wide variety of measures in place for supporting junior scientists, ranging from financial subsidies to career advice to excellent framework conditions. That's why I wanted to come to Germany, and I'm really happy that everything has worked out. As I had already lived here, I was familiar with the German science system and knew that this was the best place to carry out my research. To start with, the scientific community here takes the issues facing our society very seriously and is very active in working towards solving them. Then there was the excellent team here and the impeccable laboratory facilities - the conditions and the level of motivation were just right. You now work and carry out your research at the Max Delbrück Center for Molecular Medicine (MDC) in Berlin-Buch.Why did you choose the MDC? While writing my PhD, I discovered my interest in the functioning of the heart and how it interacts with the circulatory system. It's also important to me that my research contributes to medical advances in how we treat cardiovascular disease - the most common disease in our society. The MDC is internationally renowned for its research in this area. What are you currently researching with your Young Investigators Group? We're currently looking at the zebrafish, a model organism used by developmental biologists, to research how signal transmission regulates the development of the heart and calcium flows. We are investigating the embryonic stages of development, that is to say those that precede birth, and are hoping to find out what role these flows play in how heart cells communicate with one another. These same processes come into play during certain diseases of the heart. We have discovered that misregulated signal transmissions and electro-chemical impulses can impair the functioning of the heart - and in certain circumstances lead to heart disease. Where do you see yourself in five years? Will you stay in Germany? I love my work at MDC, and I love my life here. If it were down to me, I would stay here until at least 2020, when my Young Investigators Programme comes to an end. It's not just my decision, though. My Young Investigators Group will be re-evaluated in 2015, and the outcome of that will determine whether or not our research continues and what happens next in my career. Daniela Panáková is from Slovakia and studied biology at the Comenius University in Bratislava. She wrote her PhD at the Max Planck Institute of Molecular Cell Biology and Genetics in Dresden, and in 2007 went to work at the Harvard Medical School in Boston. There, she worked initially in the Heart Center at Massachusetts General Hospital, before moving to the Brigham and Women's Hospital in 2009. In 2008, she was awarded funding in recognition of her achievements by the international Human Frontier Science Program. Since 2011, Panáková has led a Helmholtz Young Investigators Group at the Max Delbrück Center for Molecular Medicine (MDC) in Berlin-Buch and a research group at the Charité university hospital in Berlin. Emad F. Aziz, born in 1978, works at the Helmholtz-Zentrum Berlin für Materialien und Energie (HZB). Apart from research stays in Switzerland and California, you have worked at the Helmholtz-Zentrum Berlin in Germany since the beginning of your scientific career. Why Germany? When I graduated with a Bachelor's degree in Chemistry in Egypt 13 years ago, the German Academic Exchange Service (DAAD) offered me a grant to conduct research in Germany. I was curious, accepted the offer, and came to Berlin in 2001. First I worked at the Federal Institute for Materials Research and Testing (BAM), and then in 2004 I switched to the Helmholtz-Zentrum Berlin (HZB). At the same time, I took a bilingual course at the Freie Universität Berlin to get my Master's degree in Physical Chemistry. After this, I obtained my PhD in Chemistry and Natural Sciences at what was then BESSY and is now the Helmholtz-Zentrum Berlin. I've now been at the HZB for ten years. When I came to Germany I quickly got the feeling that this is exactly the right country for me. I have built up a research group here and last year I got married. Would you have had an alternative to Germany? I could have gone to the US for a longer period, but that struck me as too easy. I need to be challenged and I follow the motto "No risk, no fun". Germany was a challenge for me from the very start: the language was difficult to learn, the people were very withdrawn at first and, worst of all, there were all the rules and formalities - particularly in the field of research: writing proposals, attracting funding, publishing. It was not easy to find my feet here but I rose to the challenge. I've now even acquired German citizenship. Things that seem impossible at first glance. I am a free spirit, I talk my ideas over with decision makers, and I motivate my team. I live and work by the principle that you should try everything and fight for a cause. In Germany I can do just that; I'm able to explore my ideas and my visions. This does my research good, as well as my life in general, which I'm very content with. I've had a long time to get used to the rules of research; they're no longer an obstacle for me. I've now got quite good at writing proposals and I've internalised the rules of publishing. Our research is in an area that brings together physics, chemistry and biology. We are investigating the electrical properties of ions, molecules and polymers in liquid environments. In concrete terms, I have developed complex measurement methods for investigating the structure of chemical and biological materials as well as the reactions of these materials in solutions and at fluid-solid interfaces. Alongside my research, I am developing a high-efficiency laser laboratory at the Freie Universität Berlin and the HZB for generating ultrashort laser pulses. Do you think you will you leave Germany one day? My whole life is here - I can't imagine a better place in the world. But, never say never. If my visions, my ideas were to take me somewhere else, I'd be open to that. Emad F. Aziz was born in Cairo. He graduated there with a Bachelor's degree in Chemistry in 2001 and obtained a grant from the DAAD, bringing him to Berlin, where he went on to obtain his Master's degree and PhD. Since 2004, he has been working at the Helmholtz-Zentrum Berlin, where he heads a Helmholtz Young Investigators Group. In addition to this, he holds a professorship at the Freie Universität Berlin. The methods he devised enable researchers to gain insight into extremely fast, complex processes, such as those that take place in catalysts or in biologically important molecules such as haemoglobin and myoglobin. In 2011, Aziz was awarded an ERC Starting Grant by the European Research Council for his research, and he has received a variety of other accolades and awards.